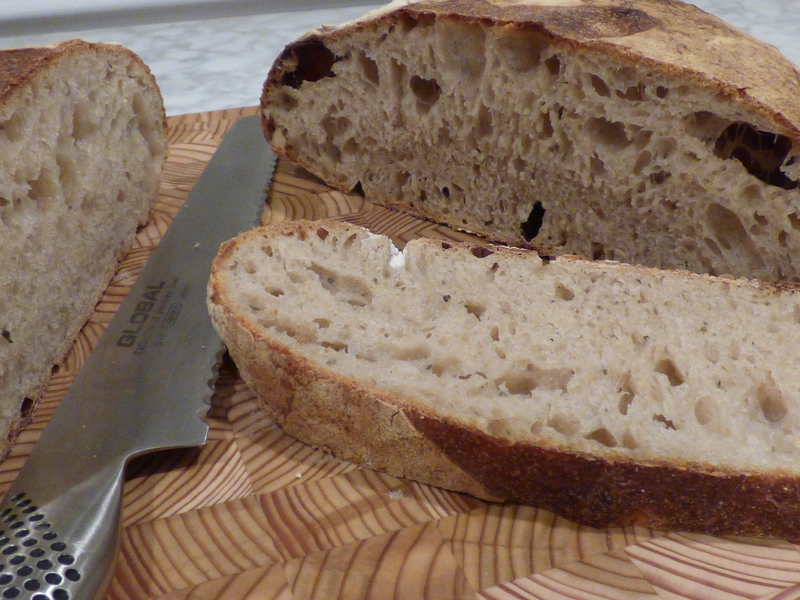 If you’ve come this far with the sourdough starter, then this is a bread walk. 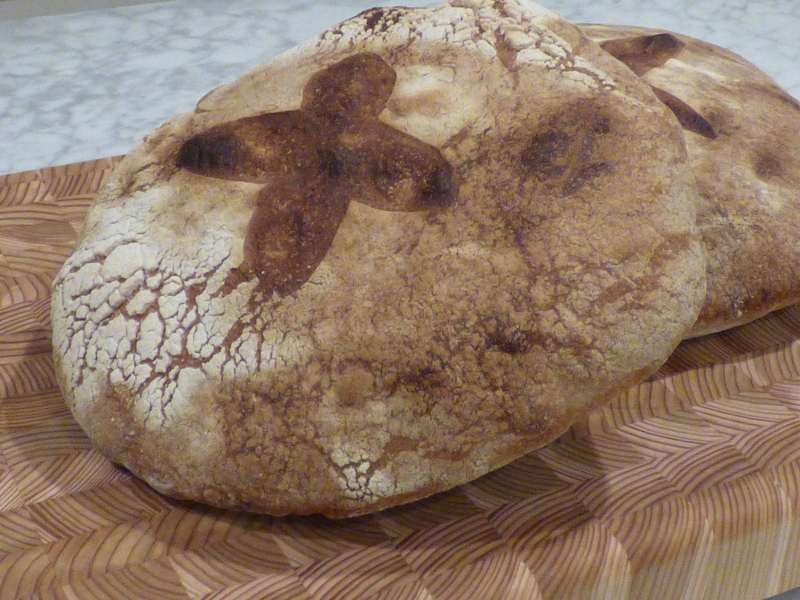 If you’d like to bake this AMAZING bread, click here for the sourdough starter that you’ll need to make first. It only takes fifteen days to make it, but who’s counting. Place water, sourdough starter, flour, and wheat germ in the bowl of a mixer fitted with a doth hook. Mix on low speed for 4 minutes. The dough should be sticky and pliable. Cover the dough and allow it to rest 20 minutes. Add salt and continue mixing on medium speed for 4 minutes, scraping down the side of the bowl as necessary with a rubber spatula. Add rosemary and olive oil and mix on medium speed until ingredients are incorporated and the dough reaches an internal temperature of 78 degrees F, about 5 more minutes. Remove the dough from the mixing bowl and lightly coat it with vegetable oil. Return the dough to the oiled bowl, cover in plastic wrap, and let it ferment at room temperature until it doubles in volume, about 3 to 4 hours. 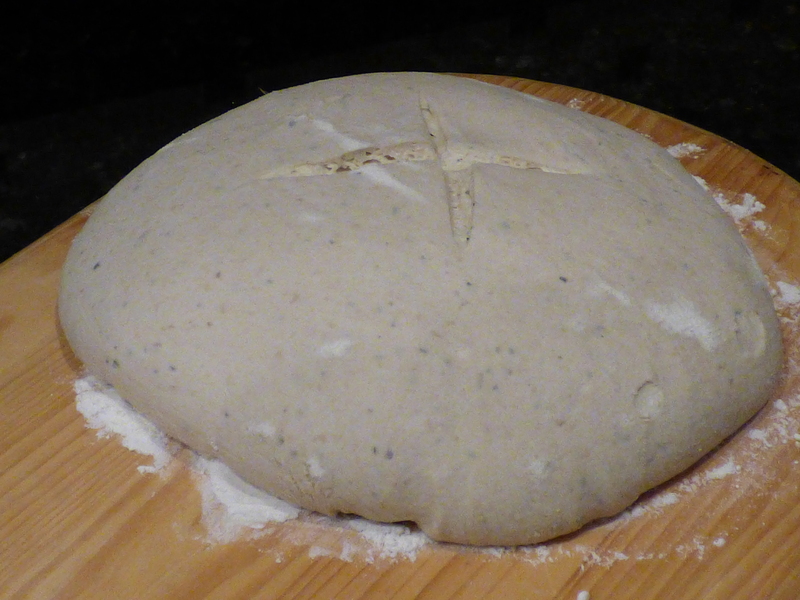 Uncover the dough and turn it out onto a lightly floured work surface. Cut the dough into two equal pieces. Slap each piece against the work surface to deflate. Tuck under the edges of each piece, cover the dough with a cloth, and let it rest for 15 minutes. 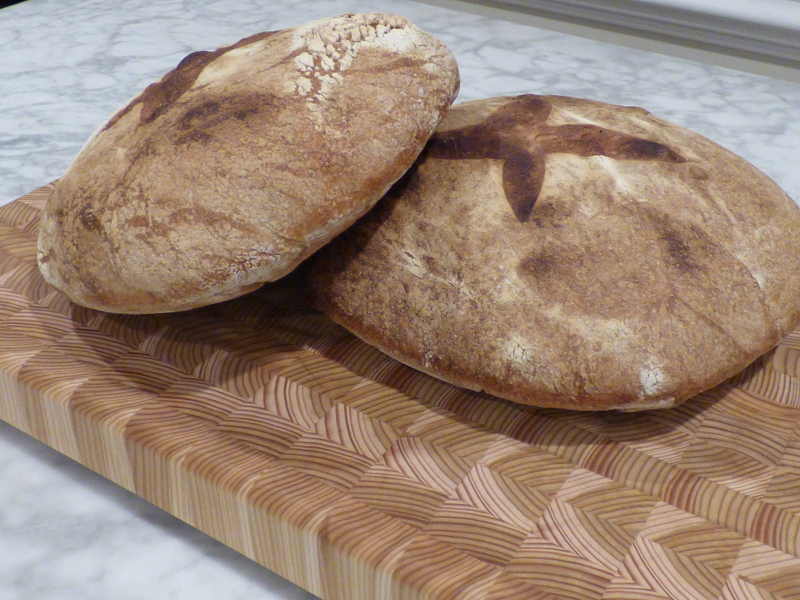 Uncover the dough and round each piece into a boule. Place the boules, smooth side down, into a bowl (unless you have proofing baskets). Cover the dough in the bowl with a cloth and let proof at room temperature until it begins to show signs of movement, about 1 1/2 to 2 hours. Remove the cloth and sprinkle the surface of the dough with flour. Wrap each bowl tightly in plastic wrap. Refrigerate for 8 to 12 hours. Remove the boules from the refrigerator, take off plastic wrap, and cover each with a cloth. Let the dough continue proofing at room temperature until it reaches an internal temperature of 58 degrees F, about 2 to 2 1/2 hours. Preheat oven to 500 degrees F at least one hour before baking. Remove the cloth and lightly dust boules with flour. Carefully loosen boules from bowls and gently invert onto lightly floured baker’s peel. With a single-edged razor held perpendicular to the boule, slash a tic-tac-toe pattern on top of each. Open the oven door, spritz the oven heavily with water from a spray bottle, and quickly close the door. Open the oven door again, slide the boule onto the pizza stone, and quickly close the door. Cut, spritz, and load the second boule in the same manner. Reduce the oven temperature to 450 degrees F. Spritz the oven two more times during the next 5 minutes. Refrain from opening the oven door for the next 20 minutes. After 20 minutes, check the boules and rotate them if necessary to ensure even baking. Continue baking for 15 to 20 minutes more, for a total of 40 to 45 minutes. Remove boules to a cooling rack. The finished boules will have a rich brown color and look swollen. How can you eat this? According to you yesterday, you, unlike me do not eat flour. Thanks for posting this exclusively for me who would never give up flour (or butter, or sweets etc)!! Thanks Jen! Your killing me! I can only salivate over this with every letter I read…..then eat some veggies….gee, what a drag!!! !